The practical approached championed in this book have led to increasing the quality on many successful products through providing a better understanding of consumer needs, current product and process performance and a desired future state. 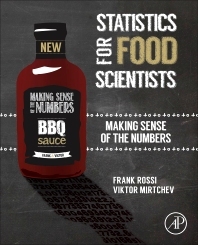 In 2009, Frank Rossi and Viktor Mirtchev brought their practical statistical thinking forward and created the course “Statistics for Food Scientists”. The intent of the course was to help product and process developers increase the probability of their project’s success through the incorporation of practical statistical thinking in their challenges. The course has since grown and has become the basis of this book. Their roles in Product Development, Product Quality, Manufacturing, Regulatory and Quality Assurance and their industry titles include Food Scientist, Food Engineer, Quality Manager and Product Developer. Chapter 14. Wrapping It All Up! Frank Rossi is Associate Director of Statistics at Kraft Foods Group. Much of his career as an industrial statistician has been in the food industry, including positions at the Campbell Soup Company and General Foods Corporation. A frequent presenter at scientific symposiums related to the food industry, he is also a regular presenter at short courses for the consumer products industry. He is the author and co-author of a number of publications on statistics in sensory science and consumer research. He obtained a BS in Mathematics and an MA in Statistics from The Pennsylvania State University. Viktor Mirtchev is an Analytics Manager in the Consumer Insights and Strategy at Kraft Foods. During Viktor’s professional tenure, he has held positions in Statistics, Marketing Analytics, Quality and Operations in the CPG, Pharmaceutical and Logistics industries while working at Kraft Foods, Baxter Healthcare and UPS. Over the years Viktor has shared his passion about statistics while teaching fundamentals, solving interesting problems and empowering teams with analytical capabilities. He is a Six Sigma Master Black Belt and holds a BS in Statistics & Computer Science, MS in Applied Statistics and an MBA.